There’s nothing better to get your adrenaline pumping than flying around corners at 100+ mph. The smell of burning rubber fills the roll cage, the engine’s deafening roar, the vibrations of the track beneath the seat, and suddenly sliding at 90 degrees with nothing to grab hold of. 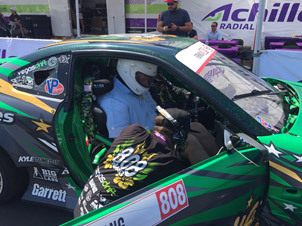 Kevin Cates, owner of Tire Town Auto Service described his recent experience riding shotgun next to a professional Drift Racing driver as they pushed Achilles Tires in the most extreme conditions. Race car engineering and performance have changed driving for everyone. The cars on the road today embody technologies that come from auto racing. Whether it is Formula One, NASCAR, Stock Car, Baja or Formula Drift, these race vehicles have revolutionized production cars in many ways, including safety, tires, brakes, transmissions, suspensions, engine components, car design, and even the rearview mirror. Tires are one of the most important elements of the vehicle in any motor sport racing. Tires are your contact patch to the road whether you are on a racetrack or the interstate. These testing events allow manufacturers the opportunity to test tires in extreme conditions to improve the product. It provides dealers with an opportunity to understand the physics, quality and performance of the products sold. In addition to Drift Racing demonstrations by Achilles Tires, Cates has participated in various other manufacturer events. BF Goodrich sponsors events to test their on- and off-road tires. Cates visited Monterrey, California where performance tires were put to the test on Formula Skip Barber 2000. In Mexico, the off-road and truck tires were tested over a three-day period at Wide Open Baha under the most extreme conditions. Cates’ dedication to education and quality have also brought him to Auto Cross Events around the country to test other brands including Cooper Tires, Michelin Tires, Yokohama Tires, Falken Tires and more. Achilles Tires partners with Formula Drift Racing to test its products. It is one of the most extreme tests put on the tires and braking systems. Warming up before any type of race or demo, a driver preps the tires and tests brakes. Heating up the tires or making them stickier to improve the rubber-to-road contact is done simply by driving the vehicles in S-shaped runs. While warming up the vehicle, the driver will brake hard to check the brakes. Now the car is ready for the run. Traveling at high rate of speed around turns, often exceeding 100 mph, the driver intentionally oversteers the vehicle and will hit the brakes hard to cause the vehicle to drift. Drifting is caused when the rear slip angle exceeds the front slip angle, sometimes to the extent where the front wheels may be pointing in the opposite direction to the turn. It’s a sport about losing traction and being able to control what happens to the tires when they no longer have contact with the road. The sport made its debut in Japan in the 1970s and has grown worldwide in the 21st Century. These events are held on dangerous mountain roads and race tracks. On a race track, the Achilles Tires testing grounds, the vehicle travels in multiple tight S-turn configurations. It’s not about who crossed the finish line first as in traditional auto racing events. Drift Racing competitors are judged according to speed, angle, showmanship, turns and lines. Achilles put their tires to the ultimate test by partnering with Formula Drift. Scientists and inventors began experimenting with improving the durability of rubber as early as the 1800’s. Inventors such as Charles Goodyear and Nathaniel Hayward made notable progress in making rubber hard, flexible and durable. Rubber is an Elastomer, a specific type of polymer or a substance of many small molecules, natural or synthetic bonded together that are capable of recovering their original shape after being stretched. In 1860 scientists began researching the possibility of artificial or synthetic rubber. Tire science and technology continue to meet the ever-increasing demands of performance placed upon the tire of today, including performance, sizing, structural and chemical construction, treads, friction, and design. Rubber gets sticky when it’s heated, which helps hold the car to the surface. However, the softer the rubber, the shorter the tire lifespan. Many racecars are changing their softer tires after several laps as opposed to consumers that are looking for long-lasting tires with good traction. Innovative tire technology as a result of racing is constantly evolving and improving for today’s vehicles. Achilles Tires offers consumers a high performing tire at an affordable price. While most other manufacturers only test their Better or Best-rated tires on the race track, Achilles assesses all of their tires in the most extreme course conditions. Founded in 1991, Achilles developed relationships as the Original Equipment (OE) provider for Mitsubishi Motors, Hyundai, Daihatsu, and other auto manufacturers. Capturing 15% of market share in Indonesia as well as market coverage in 89 countries including the United States by the end of 2012. Achilles manufactures their performance tires on a state-of-the-art production line, competing against high-end world-class performance tires from major manufacturers. The company focuses on compound development, tire construction, mold design, simulations, and process engineering. The company uses the latest simulation software which tests noise levels, rolling resistance and wet braking predictions at early stages. Their partnership with Formula Drift Racing allows them to test all of their performance tires in the most extreme conditions. Tire Town carries all types of Achilles tires as well as the tires seen on the drift racing vehicles in this blog. “We will not be undersold,” said Kevin Cates. 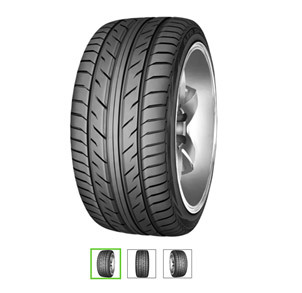 Tires connect the car to the road; quality tires help drivers maintain control of the vehicle. While Formula Drift Racing is all about losing tire traction, the tires on your Honda Civic or Ford F-150 focus on safety, performance, and durability. Tire Town’s commitment to providing consumers with best quality on any budget is demonstrated by the owner’s continued pursuit of keeping up with the latest trends in tire and automotive technology. This provides assurances that customers are greeted by a knowledgeable staff and will drive off with affordable quality tires. For more than 50 years, Tire Town Auto Service has provided customers with one-stop shop offering a full range of tires, automotive maintenance and repair services. The company stocks a wide range of value-oriented suppliers offering the quality tires at any budget. Competition is shopped regularly to ensure that customers receive the best out-the-door price. Tire Town sells and installs thousands of tires annually at each of their 4 locations: NEW ORLEANS – 4020 Old Gentilly Road, (504) 949-2703; SLIDELL – 627 Old Spanish Trail, (504) 643-7092; PICAYUNE – 608 MS-43, (601) 799-5440; and LAPLACE – 421 Belle Terre Blvd., (985) 652-4063.